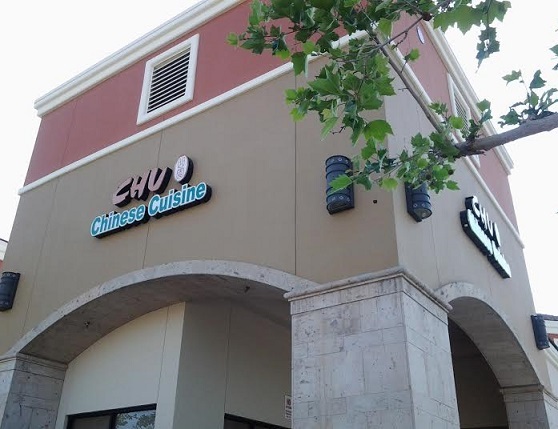 Chu has been across from Ontario Mills, in the same center as Chipotle and Kula, since about 2008. I ate there once, occasionally made jokes with friends about Chu Chinese Food being a good place to chew Chinese food and kind of forgot about the place until returning recently with a friend for dinner. 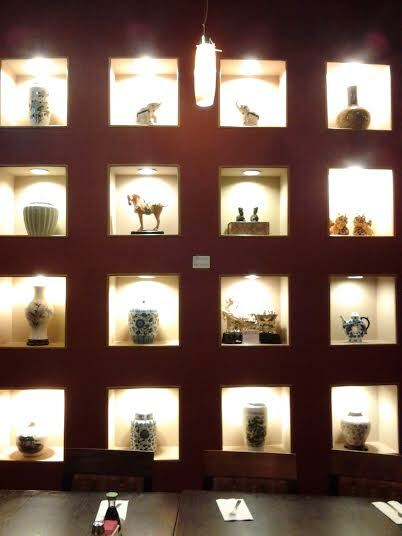 It’s a sitdown restaurant, comfortable and moderately snazzy, with vases and other objects displayed in a series of niches (seen below) and 3-D art produced with layered cutout images hanging on the walls. One depicts the Last Supper. People were seated in front of it, eating supper themselves, which prevented a closer look. All the pieces are for sale, generally at $1,000 or more, a price that would seem beyond the means of most who would eat at Chu’s, where entrees range from $7 to $13. 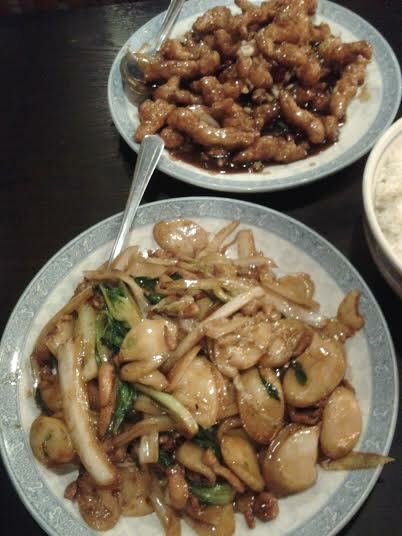 We ordered a la carte entrees from the house specialties list: fried chicken with hot garlic sauce ($11, below) and rice cakes Shanghai style ($9, bottom). The chicken came in bite-sized pieces. We liked it best, even if the sauce didn’t qualify as hot. The rice cakes weren’t the diet-food kind but rather soft, chewy discs the size and color of water chestnuts, served with a few vegetables. I liked them, although a platter of them was a few too many. Most of the rest of the menu is typical Cantonese-American fare, down to chop suey and cream cheese wontons. Unexciting, but not bad, and this is one of the few Ontario Mills-adjacent spots (Green Mango is another) where you’re guaranteed to be able to get a table quickly on a Friday or Saturday night when all the chains are gridlocked, and get a decent meal to boot.